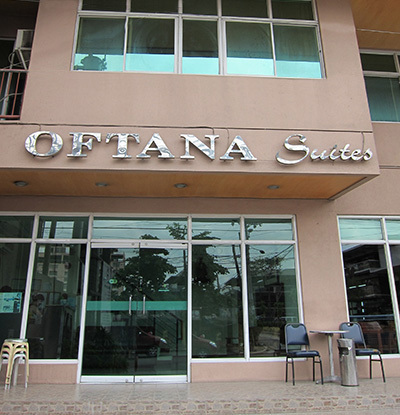 Oftana Suites is conveniently located on A. S. Fortuna Street in the heart of Mandaue City, Cebu, Philippines. The property is approximately a fifteen-minute drive from Mactan Cebu International Airport. A twenty-minute ride will take you to the world famous beaches of Mactan Island. While downtown sites, such as the Basilica Minore del Santo Nino, Magellan’s Cross, and Fort San Pedro can be accessed easily. Taxis and jeepneys stop regularly in front of the property, which make it highly accessible. Oftana Suites has twenty-four (24) rooms and two function rooms. The function rooms are able to accommodate meeting and banquet needs, with delicious menu options, audio-visual equipment and wireless internet connection. We pride ourselves on our level of service. We want to make your stay as comfortable as possible while you are here in Cebu. The staff is fast, professional, courteous, and hospitable. They are also honest and ethical. The room was beautiful. This is where I'd stay next time I'm in Cebu. Oftana is a comfortable place to stay, only drawback is the traffic outside. Good value for money with very spacious rooms and clean, clean sheets and towels. Nice place would go back at the drop of a hat. This is the third time I stayed there. Rooms are spacious, cool, and there's even some TV (if you decide to stay in for a bit), and won't break the bank, while you continue on your life adventures through Cebu! Copyright © 2019 Oftana Suites. All Rights Reserved. 20% OFF your entire stay! Note: Bookings must be made directly with Oftana Suites.